— A one-day conference for professionals in the cybersecurity space. BC AWARE in conjunction with the fantastic folk at QuickMobile are excited to share our mobile app - developed exclusively for BC AWARE 2018 attendees! 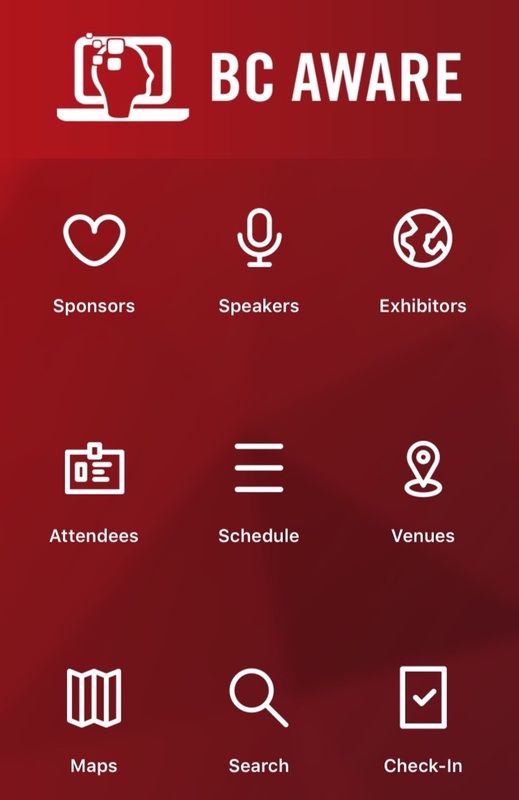 The app provides attendees with easy access to details on speakers, sponsors, schedules, exhibitors, and more! In addition to the convenience the app provides, we're going green, alleviating the need for generating printed materials, and thereby not wasting natural resources. Once downloaded, look for the QuickMobile app on your device, and then tap to launch the app. Tap on Search (magnifying glass icon at bottom of screen) and enter the Event ID: “BCAware” (no spaces, case sensitive!) The BC AWARE event should be listed. Tap the blue "+" symbol next to the “BC AWARE” event. The app's content will then download, and the BC AWARE app will launch. Continue past the disclaimer, and click the "First time user? Create a password" link beneath the white "LOGIN" banner. Enter the email address you registered with BC AWARE as your username, click "Send", and you'll be emailed a temporary password which you can then use the login.